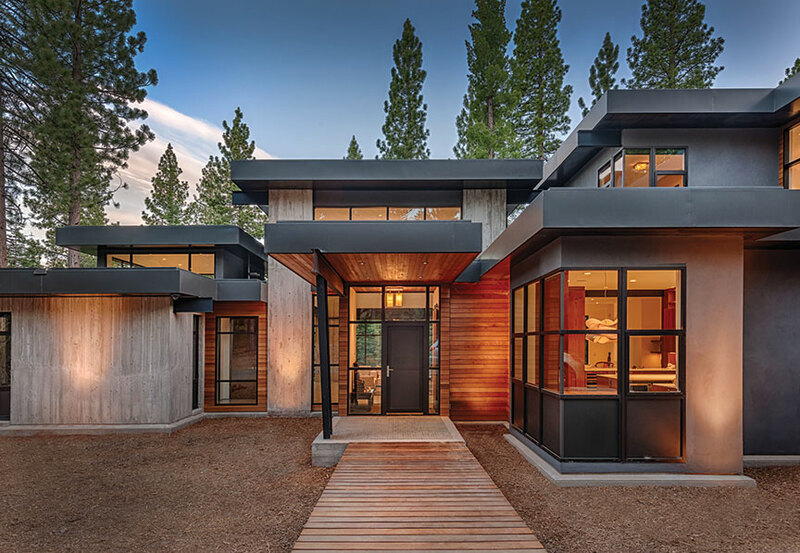 Nestled at the edge of the national forest in Martis Camp is a sanctuary from city life that departs from the “Old Tahoe” look of vacation homes past. 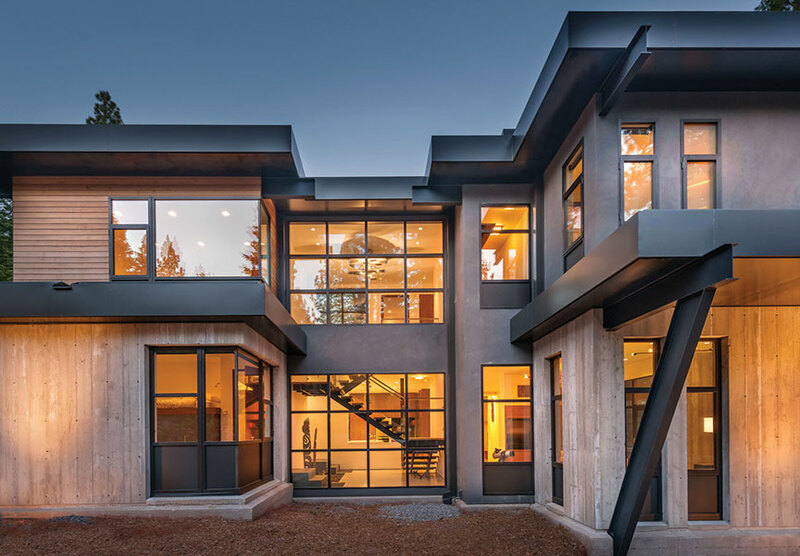 Flat roofs, unpainted vertical board-formed concrete walls and exposed I-beams form the basis for finish details that make this winner one of a kind. Save for the sliding barn doors and a dining room table carved whole from the recycled trunk of a fallen elm tree, you won’t see any exposed timbers in this house, and yet it fits beautifully in its treed setting. From the exposed concrete porch, the house appears to be all glass and steel and see-through—boasting of nothing, yet hiding nothing at the same time; Brazilian hardwood flooring in the entryway lends a Zen vibe. “We were trying to achieve a level of honesty where the materials are just what they are,” says the homeowner, who prefers to remain anonymous. A native of the San Francisco Bay Area, the homeowner would visit Tahoe for skiing and vacationing as a child. His family chose Martis Camp because it also offered amenities that appealed to his wife, who, he says, is not exactly the “outdoorsy” type. With three children and a hectic lifestyle, the owners wanted to escape the clutter and bustle of their Bay Area lives. They wanted a clean and tidy vacation home, but with plenty of storage to accommodate the added gear and clothing that comes with vacationing in Tahoe. That was accomplished on the interior with help from Henrybuilt, a cabinetmaker with offices in Seattle and New York (a city where, as the owner noted, “space comes at a premium”). 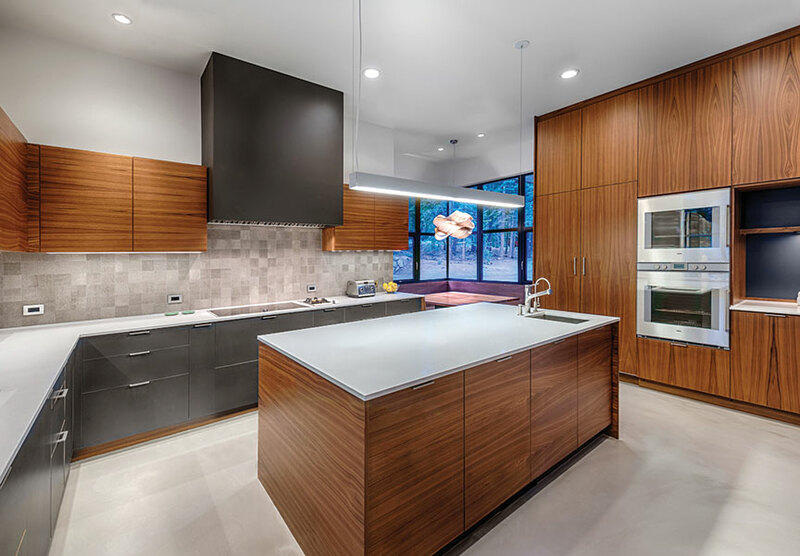 The kitchen, though spacious and clean, packs a punch with under-counter storage spaces, a built-in breakfast nook with bench seating and electrical outlets cleverly hidden beneath a countertop façade that pops up with the push of a button. Bunk beds in the children’s room are fashioned atop storage drawers and suitcase platforms without compromising the den-like feel that’s sometimes lost to efficiency. Simple lines are often the most difficult to achieve for a builder, and that was especially true for this house. Without conventional casing around the interior doors and windows, every line needed to be clean with perfect 90-degree angles at each juncture. By using a Fry Reglet detail—essentially a “Z” flashing, pre-painted black—where drywall meets the interior doorframes, the builder was able to achieve a slight reveal that creates clean lines along the framing. The detail also required pre-finishing all the doorjambs, as they would be exposed. 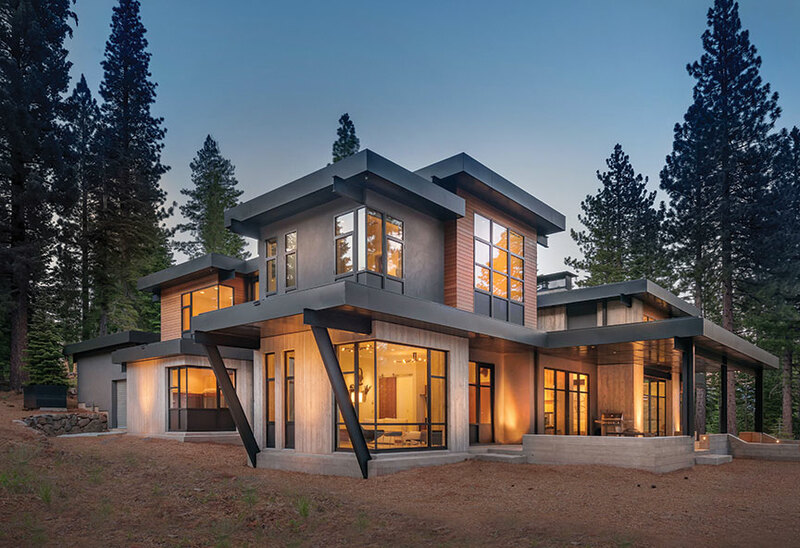 The result is a testament to the builder, Crestwood Construction of Truckee, and a poignant reminder that “simple” doesn’t necessarily mean easy. That was definitely true of the interior board-formed concrete, Gillespie says. Working with concrete doesn’t allow for much of a margin for error; adding to the challenge, Gillespie wanted it to run vertically, not horizontally, as forms are typically built for concrete pours. “I wanted to make a play on the trees in the forest,” he says, admitting it was a bit of a feat for the builder. The result, however, is exposed concrete that, from a distance, looks deceptively like pickled wood paneling because the grain of the forms, however subtle, has left its vertically oriented imprint on these functional walls. From the interior concrete to the open stairwell that came pre-manufactured in part from a supplier in Chicago, much of this unique mountain home is a direct reflection of the owners’ personal taste and aesthetic. Nowhere is that more obvious than in the handpicked fixtures found throughout the interior: A reflective halogen mosaic chandelier above the dining room table is a “modern element, but organic,” the owner says. “Like being a molecule on a crystal.” Similarly, the stick sculpture that defines the living room is a family-created design that adds a personal touch to an otherwise austere interior motif, a “sense of whimsy” that the owner says they aimed for in the overall design. “We really wanted to make this into a family project,” he says, noting his teenage son crafted the wall hanging from branches collected around the property. The same goes for the halogen-lit inset in the half-bathroom, an art niche lined with moss the family collected on their outings. The understatement of the home, with its moss and stick art and simple lines, invites the visitor to focus on the real gem of the site, which backs up on open forest. With massive sliding glass doors and a concrete patio wrapping around the entire rear of the home, the home achieves an excellent indoor/outdoor living style. In a neighborhood with a snow load of more than 250 pounds per square foot, that’s no simple feature to engineer. To deal with water management, the house incorporates an elaborate system of water runoff with low-voltage cables that heat the paths to the drains. Indoors, varying ceiling heights add to the dimensional variety of each room, and motorized systems of see-through black-out shades allow for privacy and glare protection in the upstairs bedrooms without sacrificing outside views. 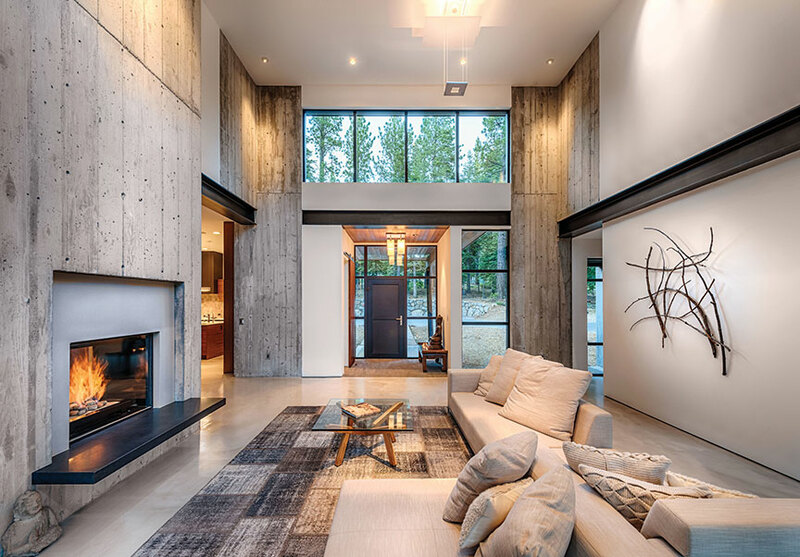 This combination of glass, unpainted concrete and steel come together seamlessly in this sleek house—manmade elements that ironically let the forest take center stage.